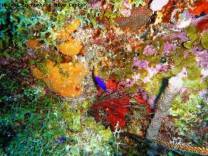 The southeast of Curacao offers remote scuba diving with excellent dive sites off Awa di Oostpunt and Klein Curacao. The lesser developed southeast of Curacao is mostly private property. The most eastern areas included in this section are Caracas Bay with its old 18th century Fort Beekenburg, Spanish Water with its many small islands and St Joris Bay with its opening to the Caribbean Sea. The latter two protected lakes are popular destinations for water activities such as banana boating, yachting, kayaking and wind and kite surfing. Jan Sofat, Tank 14 and Storm Plas (Storm Lake) are popular locations to set up your wind surfing gear. Other bays nearby on the south shore are Lagoon Blanku and Fuik Bay (Nieuwpoort), owned by the Curacao Mining Company. Awa di Oostpunt, protected for centuries for mass overdeveloping, offers absolutely stunning scuba dive sites such as No Way and Basora. The pristine uninhabited island Klein Curacao lies 16 miles south-east of Curacao and offers spectacular underwater sights, a small light house and white sun drenched beaches. It is remote, it takes time to get this far, but it is so worth it if you like scuba diving and snorkeling.